Give aways for all events - stickers, pencils? T-shirts - do we want to sell long sleeve ones? Suggest a light gray with two color logo. How many do we want to order? Draft Minutes – Wednesday, September 10, 2014 – 7:25 P.M.-9:03 P.M. In the absence of President Jane Daniels, Vice President Anwer Qureishi called the meeting to order. Due to an oversight that the minutes of the August meeting were not circulated, no motion was made to accept them. In August the IRS notified me that our nonprofit status was revoked because we had not filed a 990 for three years. A phone call determined that a computer had generated the notice as "it" used the date we applied for an employer identification number (EIN) in 2010 when a bank account was opened. IRS has a record of FoFDR filling in for 2013. A person will review our case and let us know the status around the end of September. In the meantime, I received notice that some of the paper work for the grant for the bridges (RTP grant) was not complete. As part of the grant application I had to file documents about FoFDR, which I did, but there is no record of the state having notified me that I did so. The grant is for nonprofits. I cannot redo the paperwork until I hear back from IRS. If the IRS says we lose the nonprofit status because we did not file for 3 years, not only do I have to re-file for nonprofit status and pay the fees again, but I then have to find someone to accept the money for us. The National Heritage Trust is the likely choice. These two problems have consumed more time than I would have liked. I am sorry to say that as a result I have not been able to finish the posters advertising the Friends. Jane will follow-up with the IRS regarding 501 (c)(3) status upon her return. Sign-up sheets to participate in the above events were circulated. Maria Adams and Dianne Press signed up for Invasives cleanup. Maria was in charge of the check in table and obtained the information she needed from Brian Strasavich. Dianne also signed up for Support Connection and indicated Charlie Castronovo would be there as well. 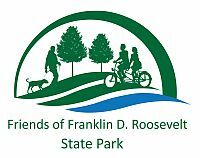 Rack card – Parks and Trails New York, the grantor of the capacity building grant, suggested that FoFDR have rack cards instead of a brochure. The suggested mockup was circulated and Anwer will place an order once Jane returns from her trip. There was a discussion of what items to give away at the above events: stickers and magnets were deemed too expensive. It was decided to order pencils, which Anwer will order. Park Managers Minute – Brian reported that large groups have been reserving the park facilities; some of them as large as 500.